Diaspora doesn’t have the luxury of humble beginnings like the great open source success of WordPress. There are too many people who simultaneously love social networking and hate Facebook for Diaspora to evolve slowly and organically. The pressure for features will come from this group. However the most important task Diaspora has ahead of it is to become a connector between social networking sites. It’s unrealistic to expect most social media users to leave commercial networks for an open source one en masse at this current time. What we should expect is for the baton to be passed to the next best service. We’ve seen this play out on the web fairly rapidly over the web’s short history: Geocities to AOL, AOL to Yahoo, Yahoo to Google, Friendster to Myspace, Myspace to Facebook, Facebook to… Despite impressive usage there is no reason to expect Facebook will maintain hegemony. When a better social network appears people will eventually forsake Facebook. We are only at the beginning of social media innovation. Facebook is successfully innovating its version of connected reality but this is only one paradigm out of infinite possibilities. Does Facebook give you everything you want? I find it severely lacking in satisfying social interaction. This tells me that it could be overtaken by the next thing that addresses its gaps. Criticism aside, many of us have invested a great deal of meaningful content into Facebook. We will likely not be so quick to abandon it as effortlessly as we left Myspace. Diaspora will serve as a social network pipeline for those who care about archiving their digital social lives. At the moment Diaspora can send general text signals to Facebook, Twitter and Tumblr but can’t yet receive them. This makes it seem like it’s supposed to only function as an alternative to these. These crucial receive functionalities are indeed coming (think about how native mobile apps like Flipboard and Tweetdeck work). Diaspora is not centrally hosted but distributed across different web locations in units called pods. 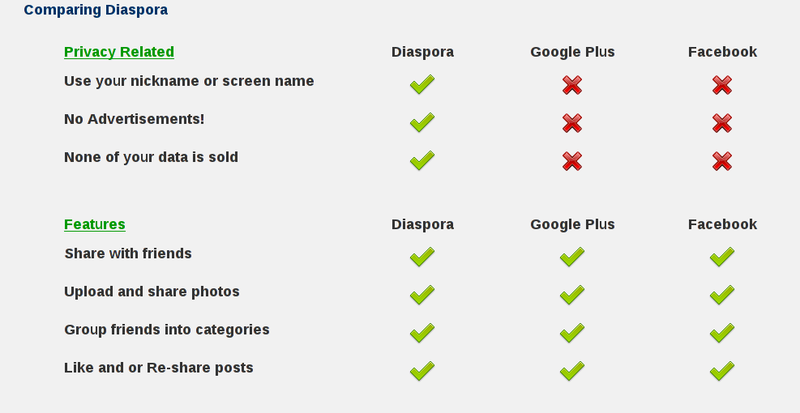 Most people will opt to sign up to use Diaspora on their system (their pod). It’s as easy as signing up to any social network (you can even join with your Facebook login). What differentiates Diaspora from all other major networks is that if you choose to, you can setup your own pod on your own web host yet still connect to the Diaspora community at large on other pods with your profile. It is in self-hosted pods where Diaspora will find longterm success. Let’s look at WordPress for a second. WordPress is the most used CMS on the web. Its success is partly because it allows people and businesses to fully control and own every part of their website from content through development. Tricking out this blog with features is actually a hobby for me. Imagine having that same level of control with your social network and profile. One can nearly see blogging and social networking blending seamlessly together: A superblog that sends and receives messages in the way we’re currently confined within Facebook. So let’s add this up. You move your social data intake and output to Diaspora. When the winds of social change sweep away Facebook you’re sitting pretty because your data is right where you can see it in your self-hosted or shared pod ready to connect to the next super network. When people see how owning your social data has been democratized in the same way as having your own blog/site is today people may flock to Diaspora. For what appears to be a ragtag operation Diaspora is beautifully designed and developed. It’s much more elegant than Google+ and far more simple and transparent than Facebook. I should also note that while my Google+ profile is stagnating my Diaspora following is slowly and steadily picking up steam. The people I’ve connected with on Diaspora seem more interested in actually being social than on any network I’m on thus far (save Rdio). Admittedly Diaspora has lots of subversive street cred due to its origins and this does attract a certain kind of socially engaged user (which is just fine with me). There are a great many challenges ahead for Diaspora. Many of the features I’ve just written about are not yet implemented. Diaspora is still in Alpha as I write this. It should also be considered that Facebook is innovating off its own paradigm rapidly. Many new Facebook developments require major privacy compromises. The newest of these, frictionless sharing, could fundamentally change the web as we know it. A Facebook web represents a web that does much thinking and decision making for us. Diaspora represents a web where we continue to think and decide for ourselves. What would be especially cool is if you wouldn’t even have to use Diaspora, if the way pods interact would be an open specification that could be implemented by any social network, allowing you to befriend people who are not on Diaspora. Then, if something better than Diaspora were to come along (though that is unlikely, as Diaspora, being open source, itself could be improved), you could just move there and carry along all your friends who are still on the previous best thing. That is the dream I’m holding out hope for! When I successfully install a Diaspora pod on my server I’ll document that and hopefully have some interesting insights to share. So far, I love the quality and engagement level of the early adopters on Diaspora. Time will tell if this can be maintained, but I hope that if we set a good example, it’s sustainable. Flipboard appears to be iOS only, but TweetDeck is not solely an iOS app. It is available for desktop (Linux, Mac, and PC, I believe), for Android, and for Chrome in addition to iOS. You did a nice job of explaining Diaspora’s pod system, and I liked your summary of the history of social networking so far. Well done! Time will tell but I’m feeling very optimistic about Diaspora. It won’t be a success for Diaspora per say, but a success for its users.